… a presently elevated growth rate of CO2 in the atmosphere directly linked to globalization. … so a likely 1.5 degree C warming likely by 2030, TEN years earlier than the recent IPCC estimate. but is fully data based, meticulous and well within the IPCC uncertainty, making it plausible. So in pushing the envelope on theory it challenges others to try to confirm or dispute the findings. Losing 10 years on preparing for 1.5 degrees C also makes this finding, if true, extremely urgent to respond to. Atmospheric CO2 – To understand climate change it helps to start with the whole picture, the great sweep of increasing concentration of CO2 in the atmosphere shown in Figure 1, as the main cause of the greenhouse effect. Looking at where it began, you can clearly see the fairly abrupt shift in the trends at about 1780, also about the same time as rapid industrial growth was beginning, seeming to mark the abrupt emergence of fossil fuel industry that the rest of the curve clearly represents. 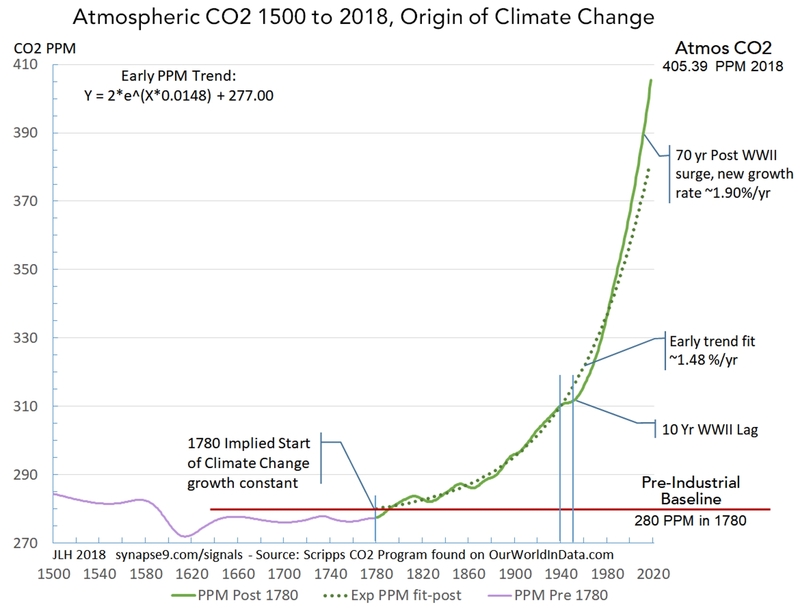 Look closely at the relatively lazy shapes of pre 1780 variation in CO2 back to 1500 (purple) and how that pattern differs from the abrupt start of the growing rates of increase (green line) after 1780 an how closely it follows the mathematical average growth rate curve (dotted). Note how the trendline threads through the fluctuations in the data starting from 1780. The way the data moves back and forth *centered on the constant growth curve* is what implies that the organization of the economy for using fossil fuels had an constant growth rate, of 1.48 %/yr. Hopefully that seems rather remarkable to you, but the data is clear, that the global economy has a single organization for behaving as a whole, as a natural system, with a stable state of self-organization in that period. We know from the absorption of heat radiation by CO2, creating the greenhouse effect, that the CO2 greenhouse effect is heating the earth in relation to its concentration in the atmosphere. What implies that relation is close to linear, making the effect directly proportional to the cause, is shown in the Figure 2. The dashed brown line shows the slope of the relation, closely fitting the actual gradual curve, at least between 300 to 400 PPM, the thresholds that were crossed in 1914 and 2016 respectively, a period of 102 years. Atmospheric CO2 is increasing much faster now, though, so the next increase of 100 PPM, to 500 PPM, will be reached much more quickly rising at its current stable rate of 1.9 %/yr rate. If that rate continues 500 PPM will be reached in only 30 more years, by 2046. That large acceleration is the effect of the current higher exponential rate of increase. Of course, considering the rapid compound acceleration of the cause of climate change, and the alarm people are taking now, quite a lot could happen before 2046. 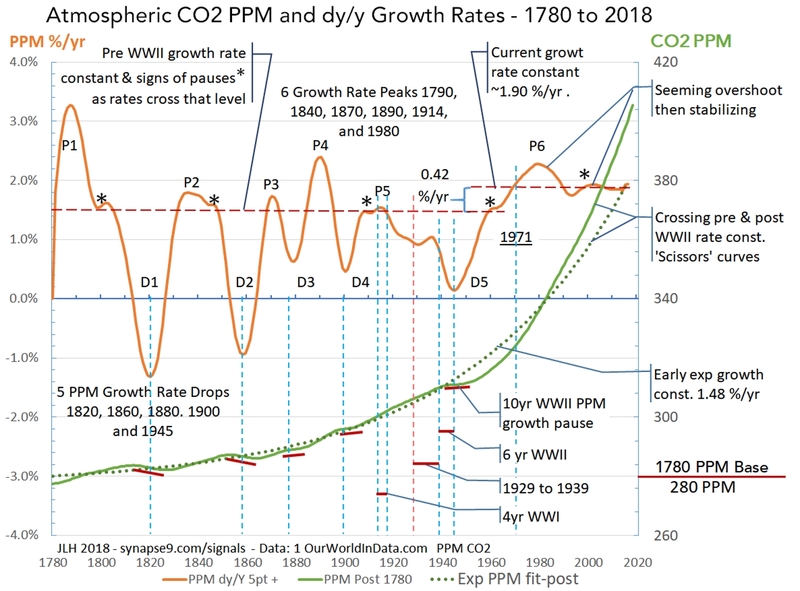 The Annual PPM Growth Rates – Figure 3 shows the growth of Atmospheric CO2 (green) with the details of its fluctuating annual growth rates, to depict both the constants of the growth curve and it’s irregular growth rate interruptions. The individual interruptions raise lots of interesting questions, but perhaps the most important feature is that they are quiet temporary, as evidence of the constant behavior recovering again and again. The upper curve shows the fluctuating annual growth rates (lt. axis, PPM dy/Y) for PPM concentrations, the curve below. The peaks and drops of the growth rate align with the small waves in total concentration (rt. axis). Note that the large drops in the growth rate snap right back to the the horizontal dashed red lines that show the growth constants PPM concentration curve as a whole, around which the yearly growth rates homeostatically fluctuate. It gives you an somewhat anatomical picture of the homing dynamics of the global growth system as it first hovers around the lower rate 1.48 %/yr from 1780 up to WWII, and then shifts to hovering around the higher rate of 1.9 %/yr as it stabilizes from 1971 to 2018. You might think of the world economy as having long periods of very steadily accelerating expansion and CO2 generation, interrupted by short periods of some other process causing the big dips in CO2 growth rate. You might think those might be great recessions perhaps, but I could not find corresponding recessions, and for the great recessions on record there do not seem to be notable dips in CO2 accumulation. To validate this kind of research one has to go through that kind of thought process for every bump on the curve. What seems most unusual about the big dips in the CO2 growth rate is that 1) they do not occur after WWII and 2) they rise and fall so sharply and have no lasting effect. It seems unlikely but vast ocean plankton blooms might have that effect, absorbing and then releasing large amounts of CO2. Whatever cycle that was it seems to have been interrupted by the rapid acceleration of warming that followed WWII. Figure 3. Atmospheric CO2 concentration (CO2 PPM)(rt. scale) and its annual growth rates (PPM %/yr)(lt. scale), showing the change in growth constants before and after WWII. The key evidence of these being different organizational states of the world economy (before & after WWII) is regular “homeostatic” (home seeking) reversal of trends departing from the growth constants. It is the post WWII growth constant state of 1.90 %/yr that is preventing normal policy process from intervening in climate change, and needs to be “recentered” on learning from nature rather than overwhelming nature for our survival. Comparing the CO2 cause and degree C effect – The main purpose of Figure 4, comparing the history of earth temperatures (blue, ‘C, lt scale) with the curve of atmospheric CO2 (PPM, green, rt scale) is to let us look closely to see if any shapes of the cause of the greenhouse effect (PPM) are clearly visible in the shape of the effect, global warming (‘C). Does anything in particular jump out? The HadCRUT4 earth temperature data (‘C) is shown relative to an absolute value set point of 14.6 ‘C in 2017. That is done to use a more familiar unit of measure and so that the 1780 pre-greenhouse effect temperature we will find can be stated in a familiar scale (Figure 5). The 14.6 ‘C value was based on an expert’s estimate, used here to coordinate the temperature anomaly scales with a more familiar universal scale. The IPCC uses the 1850-1900 average as a reference baseline scale and other researchers use a variety of others baseline scales. The first thing you notice about the Figure 4 ‘C curve is how highly irregular it seems to be. That variation is thought to be mostly due to shifting ocean currents, as well as weather circulation, making it very difficult to directly measure the temperature of the the earth as a whole. The ‘C curve also shows the two ‘Great waves’ in earth temperature prior to the emergence of the greenhouse effect. The dynamic shape that makes the two curves seem connected is the way the greenhouse forcing effect of PPM and it’s response in ‘C both break out of the earlier shapes beginning in the 1980s. The dotted red line was visually interpolated as the midline of the fluctuating annual temperature curve, extending with the blue dotted line to approximate the earlier large waves in the temperature change prior to annual data from the HadCRUT4 record. The dotted blue line was produced by adjusting the scale of Figure 5 to overlay on Figure 4 and hand drawing a continuation of the Figure 4 midline curve that fit the Figure 5 curves. 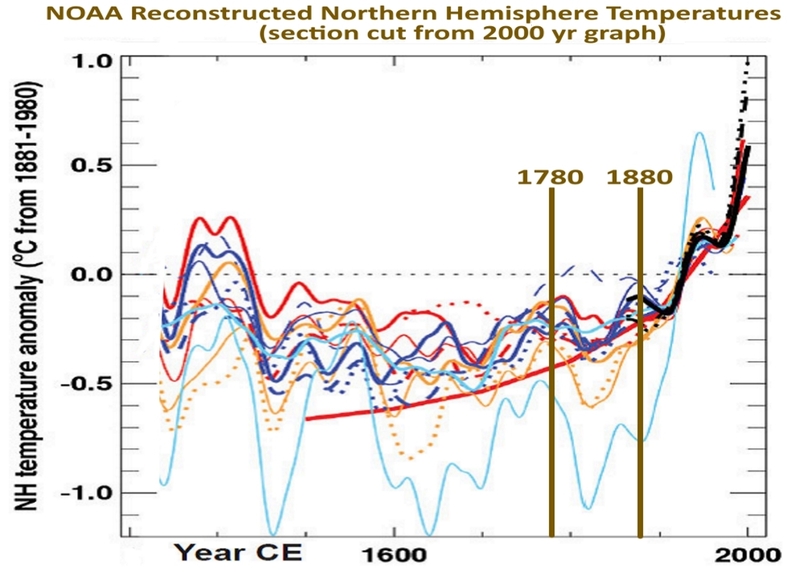 Figure 5 – NOAA (2007) 1300 to 2007 Northern Hemisphere record of temperature reconstructions. Measured from a 1881-1980 baseline. This it taken from a longer history keeping the units and adding a title and dates 1780 and 1880 (brown). That is the period after the greenhouse effect began before it was visible in the records of earth temperature. The red line shows a NOAA speculation that warming developed a bit slower than found here. Atmospheric CO2 as a Proxy for Temperature Change – The variation of the ‘C curve in Figure 4 is so erratic it’s hard to find any continuity to project it into the future, except to generally extend a straight line. The PPM curve on the other hand has a very simple dynamic, that we have established as having settled on a 1.9%/yr exponential growth rate. That gives it a very clear direction for projecting its future, albeit with increasing uncertainty over time partly due to the plans for highly disruptive cutting CO2. They have been delayed for decades but might possibly begin to take effect in the near future. To see where the current stable growth rate of climate change is headed, knowing the PPM curve should be linearly proportional to the greenhouse effect, we might experimentally scale it see if it fits the ‘C curve in a logical way (Figure 6). Scaling the PPM curve to fit the ‘C curve makes a PPM’C proxy temperature curve, used to project the midline of the highly irregular ‘C curve which because of that can’t be confidently projected. There are three determinants for doing that, using PPM’C = A*PPM + B, a linear scale factor A and a baseline B, and then third the decisions on how to fit the two shapes which seem to only coincide in the most recent period. So basically I tried lots of things, and only slowly realized it was a mistake to try to fit the PPM’C curve to the midline of the earlier ‘Great waves’. Then I realized those earlier great waves were really not related to the greenhouse effect, and so my greenhouse effect projection might better be interpreted as punching though the earlier systems, like it looks. Then when I adjusted the PPM’C curve to just pass under the ‘Great Waves’ following the miline of local fluctuations instead, the fit of rapid growth period was suddenly as perfect as I could ask for. 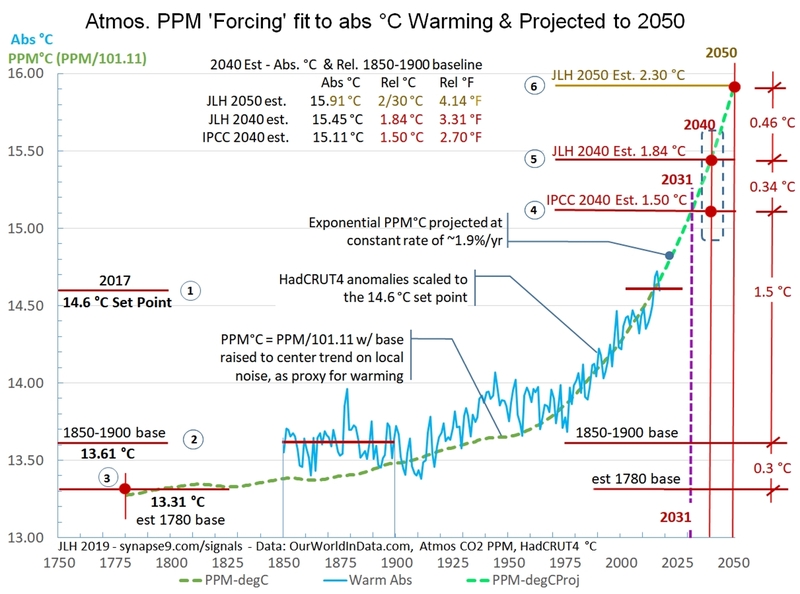 That PPM’C curve then becomes the hypothesized most likely “real” rate of continuous climate change predicted by homeostatically growing atmospheric PPM. Figure 5 shows the best fit scaling of atmospheric PPM to the earth temperature data (dashed dark green line), extended to continue the its presently stable 1.90 %/yr growth rate (dashed light green line). Yes it has taken a while to work through all the uncertainties, but the findings do appear to be well within the uncertainties of the recent temperature trends, and quite important for others to know about if possibly true. 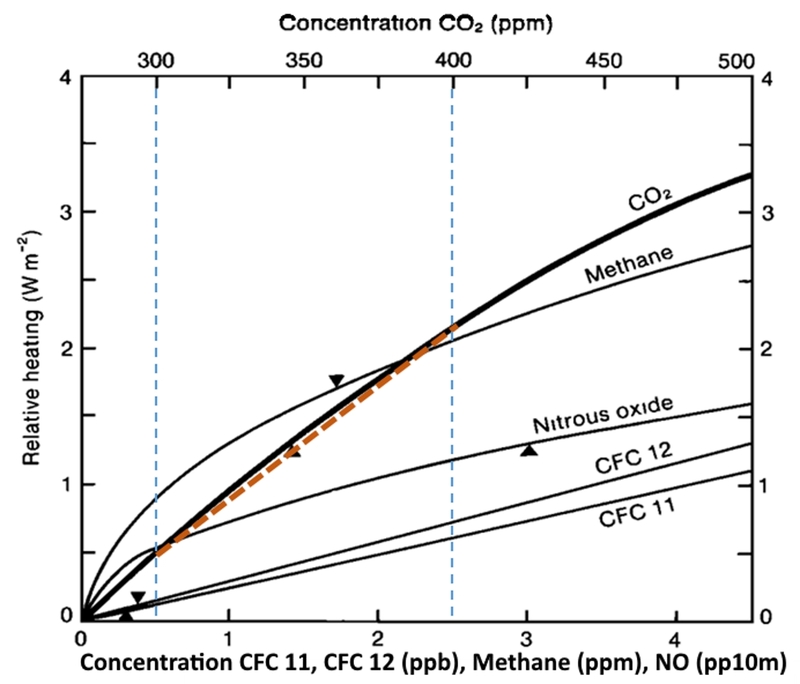 Figure 6 – The PPM’C curve scaled to closely fit the HadCRUT4 data and then projected at the homeostatically stabilized growth rate of observed in atmospheric CO2. How long this projection might hold depends on how robust the global natural and economic systems driving the growth rate in atmospheric CO2. 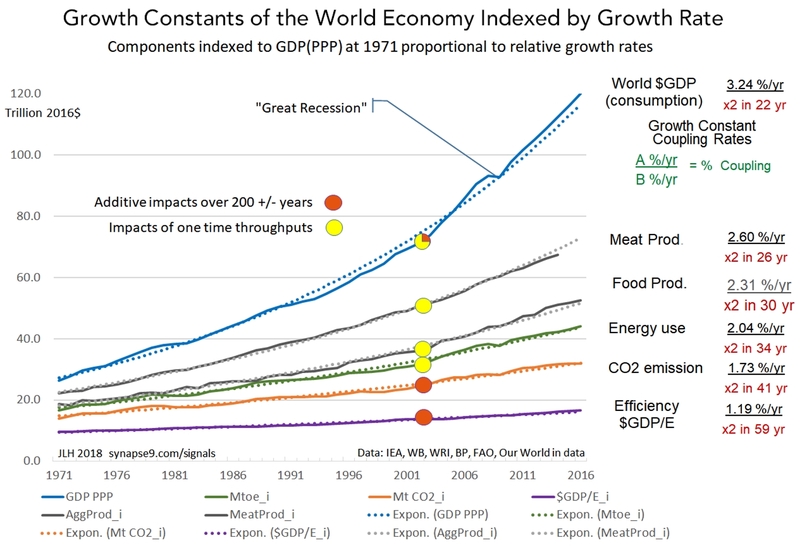 The Economy as a Whole – How great a new threat this acceleration in atmospheric CO2 pollution and its greenhouse effect are seems to rest on just how stubborn the global homeostatic regulating systems observed are. That could really change the climate mitigation picture, and help explain why there has been only negative progress in slowing CO2 pollution. So far is seems to have been neglected, with negotiation over mitigating climate change not seeming to take into account the organizational inertia and persistence of the global economic system as a whole. 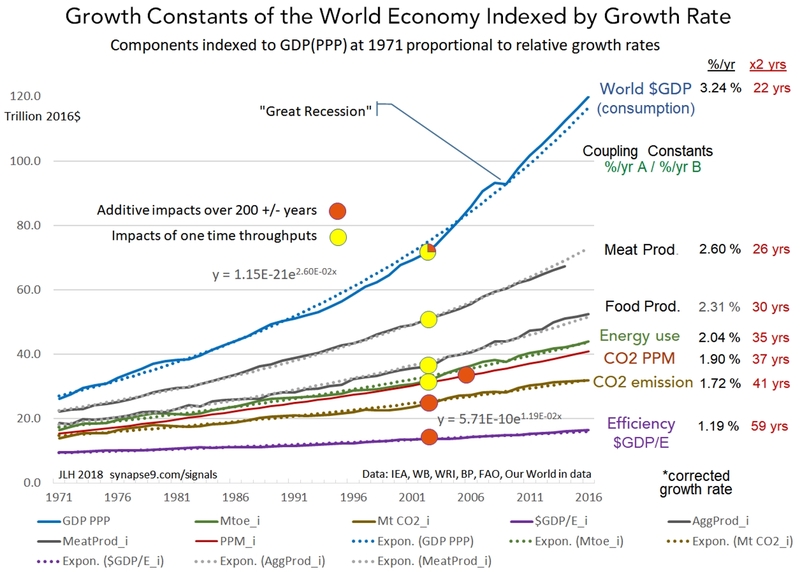 Figure 7 shows a group of major indicators of the global economy that were selected for having constant growth rates from 1971 (the earliest data for some) to 2016. The GDP PPP curve in trillions of 2016 dollars is growing the fastest, and each of the other curves was indexed to GDP in 1971 in proportion to their relative growth rates. For example, since total economic energy use is growing at about 2/3 the rate of world GDP that variable was scaled to 2/3 of GDP at 1971. This device displays the steady relation between them called “coupling.” That the same proportionality of the growth curves is constant throughout it indicates each of these curves reflects the behavior of the same system. What seems to cement the view that the global economic system appears to be behaving as a whole is the visual evidence that the data of each of these series, like the CO2 PPM data we discussed at length before, seems to fluctuate homeostatically about the growth constant. What physically coordinates the economy’s coordinated relationships between different sectors displayed here as growth constants seems likely to be cultural constants of each cultural institution, or “silo” of the world economic culture. Every community seems to develop its own expected way for things to work and change and seems to become the way the different sectors end up coordinating their ways of working with each other. That all of this is organized primarily around the use of the exceptionally versatile resource of fossil fuels then indicates that a deeper reorganization of the economy than a swapping of one set of technology for another will be involved. It should suggest to any reader just how very much of the world economy would need to be reorganized, and to be reminded that the last times the world economy was sufficiently disrupted to be reorganized were during WWII an the 1930s. This topic is also the subject of a longer research paper. Science review drafts are likely to be available later in April 2019. Figure 7. The global economy working remarkably smoothly as a whole system of coordinated parts, seemingly much like theory says it should, but most people don’t see because they don’t look at the behavior of the system as a whole. Figure 8 – Smoothed annual growth rates of recent world energy use and CO2 emissions, showing close coupling of their fluctuations with relatively insignificant trend. Figure 9 – Log Plot of Figure 7 variables with a 1780 to 2020 time scale. 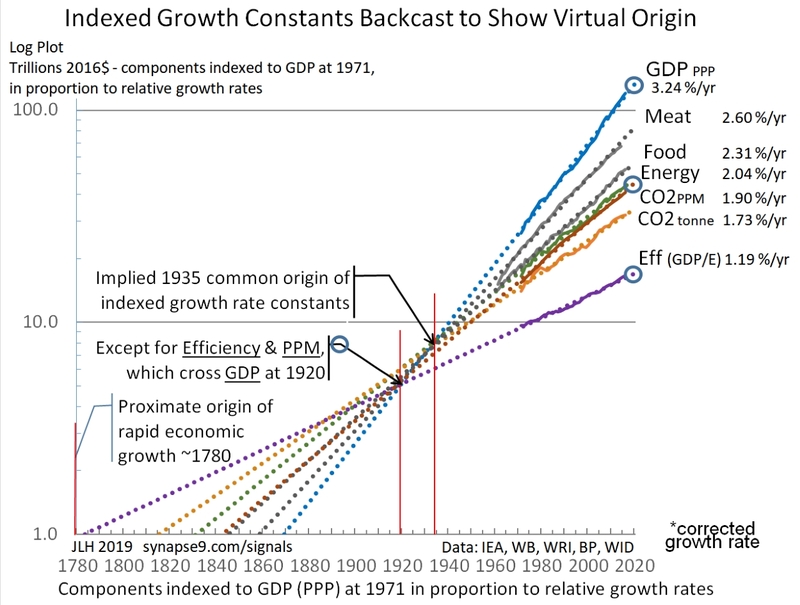 The backcasting of their exponential constants displays the convergence with the backcast GDP trend of four of them at ~1935 and with two others (blue circles) at ~1920. The effect implies the stable coordination of the parts of the global economic growth system established by the 1970’s was in the 1920s and 30s. Below this line the figures are current but text is mostly from outdated edits! It’s a powerful technique for understanding complex systems, such as the world economy, that behave smoothly as a whole. The most important observation is just that. The system as a whole and these whole system indicators are not separate variables, and the smoothness of the curves shows the system as a whole behaving smoothly as a whole over time. From our local views of the world that often does not seem to be at issue, though it really is the main force behind all the changes everyone is struggling to adapt to. Individual businesses, cities and countries generally have a quite irregular experience, as their roles in the whole continually change. What the smoothness of the curves and the change in the system as a whole really means is that the world economy is working the just the way it is (financially) supposed to. It is being globally competitive the way money managers manage it, and continually reallocating resources and business to where they will be best utilized, resulting in most every part having somewhat irregular experience to make the whole behave smoothly. The uniformity of these global indicators also says is that their origins all point back to ~1780, when modern economic growth began. We have reasonable measures US economic growth from ~1790, …and so went the world! Smooth exponential curves and the systems generating them are, of course, among the things of nature with inherent “shelf lives”, relying on systems of developing organization of multiplying scale and complexity, certain to cross thresholds of transformative change. In nature, growth systems generally develop to one of two kinds of transformation, stabilization or destabilization, the crashing of a wave that doesn’t last for example or the thriving business that can last for generations. What characterizes the difference for the emerging systems that last is that, while becoming strong with compound growth (like the systems that don’t last also do), they become responsive and refine their systems to stay strong. In economic terms that’s remaining profit seeking they “internalize their externalities” to mature toward a peak of vitality rather then failure. It’s a choice made in mid-stream. Understanding what will make that difference in outcome for our global growth system will partly come from people getting a better understanding of how we got here, as shown in the Figures 1, 2, 3 & 4. The growth of technological civilization relies on ambition, creativity and resources, and methods that we could potentially change. How economic growth is largely managed by the application of business profits to multiplying business developments, what makes GDP to grow. If our decisions were to internalize our externalities that is also one of the things that might change, without really changing human ambitions, creativity or resources. I will get around to describing the data sources for the figures, maybe making the data available, and perhaps adding other notes. I didn’t need to do anything very tricky, just a very little math and Excel. The dotted lines are the exponential trendlines that are so easy to make.